New goalkeeper store - www.goaliesball.co.uk coming soon! Darren started playing in goal from the early age of eight years old and became one of the most sought after goalkeepers in his area representing all of the leagues he played in. He also represented his district Keighley. His talent was then recognised by Bradford FC where he played for several years for Bradford Boys FC. At the age of fifteen Darren was scouted by Sheffield Wednesday for an apprenticeship position. Sadly after a few months on trial he was released because of his height. Darren then went into semi professional football where he played for Bradford Park Avenue which were in the Unibond at the time. He won ‘Player of the year’ in his first year at the club and enjoyed a few seasons until he left. He then enjoyed other successes around the semi professional leagues for a few more years before deciding goalkeeper coaching was the way forward for himself. Darren joined Just4keepers in September 2009 as he felt that being part of an International Goalkeeping schools, would give his students more options to take their goalkeeping to a even higher level. Darren is also FA qualified. Check out the new video of the otter pool class in actions. Here we go over several goalkeeper drills, from the basic catch, to coming for a cross. To shot stopping exercises. J4k has done it again, this time Billy Smith signs for Leeds United on a 2 years deal. Billy attended J4k for 18 months and as a result of his hard work, now has the opportunity to achieve his dream of becoming a professional goalkeeper. Just shows you what can happen if you put int the effort at J4K. 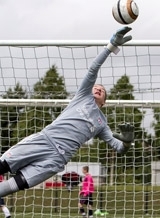 This is the J4K student Rex oldfiend making a great save at the just4keepers academy. Rex attends goalkeeper training in Bradford with myself and I believe if he keep working hard, he has a chance of doing something special in the game.